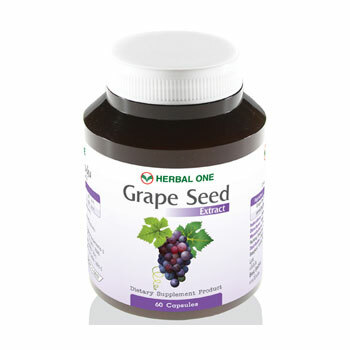 Regular intake of grapeseed extract prevents the risk of stroke and cardiovascular disease, diabetes and high cholesterol. It also delays retinopathy, fights free radicals, helps to ensure a healthier skin, is effective against melasma, age spots and reduces progression to certain cancers. 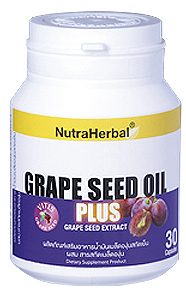 Regular intake of grapeseed oil prevents the risk of stroke and cardiovascular disease, diabetes and high cholesterol. It also delays retinopathy, fights free radicals, helps to ensure a healthier skin, is effective against melasma, age spots and reduces progression to certain cancers. Grape phytochemicals such as resveratrol, a polyphenol antioxidant, have been positively linked to inhibiting cancer, heart disease, degenerative nerve disease, viral infections and mechanisms of Alzheimer's disease. 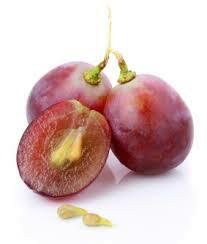 Protection of the genome through antioxidant actions may be a general function of resveratrol. In laboratory studies, resveratrol bears a significant transcriptional overlap with the beneficial effects of calorie restriction in heart, skeletal muscle and brain. Both dietary interventions inhibit gene expression associated with heart and skeletal muscle aging, and prevent age-related heart failure. Since the 1980s, biochemical and medical studies have demonstrated significant antioxidant properties of grape seed oligomeric proanthocyanidins. Together with tannins, polyphenols and polyunsaturated fatty acids, these seed constituents display inhibitory activities against several experimental disease models, including cancer, heart failure and other disorders of oxidative stress. Botanically speaking, a tomato is a fruit since it is the ovary, together with its seeds, of a flowering plant. However, from a culinary perspective, the tomato is served as part of a main course of a meal, as are other vegetables, rather than at dessert. The term "vegetable" has no botanical meaning and is purely a culinary term. Tomatoes have many antioxidants including the popular lycopene. Is a Lycopene supplement necessary for optimal health? If you have a high intake of tomatoes and fruits such as pink grapefruit or watermelon that have a high lycopene content, you may not need additional lycopene supplements. However, if you shun tomato products, and hardly eat watermelon, pink grapefruit, or other lycopene containing foods, then a lycopene supplement could be of benefit to you. To learn more about lycopene. Lycopene content of tomato and tomato products per 100 grams. Tomato Juice has 9 mg; Tomato Ketchup 17 mg; Spaghetti Sauce about 16 mg; and Tomato Paste has about 30 mg. In contract, a raw tomato has about 3 mg per 100 grams of fruit.